Estrogen balance for women is crucial for achieving and maintaining fat loss. If you have estrogen dominance, it can lead to toxic fat gain, bloating from water retention, and a can lead to a decline of overall health and wellness issues. It's natural for women to have a natural decline in testosterone and progesterone levels, leaving a excess of estrogen. Also, We are constantly exposed to estrogen-like compounds in foods that contain toxic pesticides, herbicides, and growth hormones. More weight gain then leads to insulin resistance which, you guessed it, increases the risk of estrogen dominance. Estro-Cleanse helps naturally calcine your body from estrogen naturally without the use of medications. Stop the cycle of weight gain that leads to insulin resistance that again increased the risk of health disease, estrogen dominance and many other risk factors for women. When levels of Estrogen get too high, you'll feel fat, slow and tired. Estro-Cleanse has two potent ingredients that helps your body reduce estrogen. Resveratrol is also beneficial to your body in that it helps you develop an insulin resistance. This helps you from getting diabetes. Research also found that resveratrol is also useful in treating diabetes by lowering high levels of glucose levels, which are common among diabetics. Why Would you Use Estrogen Reducer? The food market today is loaded with foods enhanced with estrogen. An estrogen loaded diet has a negative effect on men’s bodies. Too much estrogen in a man’s body can lead to a reduction of energy and excess body fat. 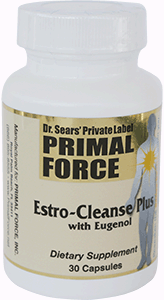 Primal Force ‘s Estro- Cleanse is the solution for you to counter act the negative effects of estrogen in your body. The Primal Force Estro -Cleanse will help cleanse your body of excess estrogen . Regain the benefits of the testosterone in your body with a leaner body, more muscle mass, and increased libido. Stop the negative effects that estrogen can have on your body such as loss of virility, obesity, and prostate growth. Dr. Sears developed the Primal Force Estro-Cleanse with cruciferous vegetables such as broccoli and cauliflower which metabolizes estrogen and flushes it from your body. This supplement is a safe and natural way to get rid of excess estrogen. Each bottle includes 30 softgel tablets . Regain the benefits of your manhood with Primal Force Estro-Cleanse today!